Experience the magic of New York City in the winter by ice skating at the Wollman Rink Central Park. Admire the sparkling city skyline as you glide along the ice with your friends, family or that special someone in this iconic rink featured in numerous Hollywood movies. Ice skate rental is included, and your admission ticket guarantees entrance. Follow up your skate with a slice of New York Cheesecake with the purchase of an entree at Planet Hollywood in Times Square. 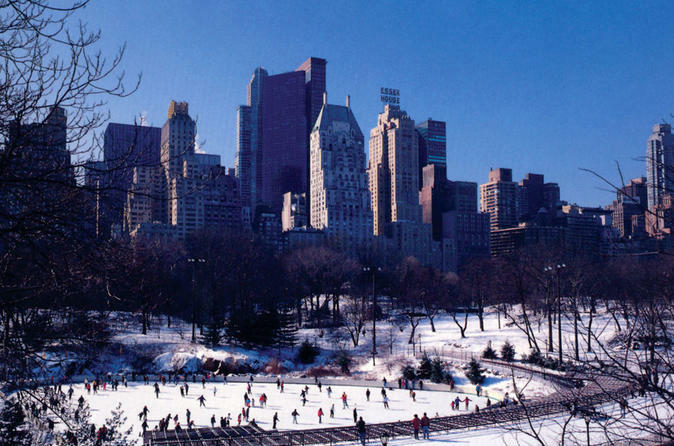 Head to the Wollman Rink Central Park for your fun ice-skating experience! Simply present your ticket, pick out your ice skates (rental included), and head out onto the ice. This iconic ice-skating rink, featured in numerous Hollywood movies such as Serendipity and August Rush, is hugely popular, but your ticket guarantees admission! Relish the magical winter atmosphere as you glide along the ice. Admire New York City’s dazzling skyscrapers and Central Park’s lush landscape adorned in festive Christmas lights and decorations. This is the perfect activity for you and your friends, family or that special someone. See you on the ice! After your skate, enjoy a slice of New York cheesecake with the purchase of an entree at Planet Hollywood in Times Square. Planet Hollywood New York gathers your favorite movie memories in one exciting destination. Gaze up at spaceship models from major Sci Fi features in the City Room. Feel like you’re flying into the danger zone when you see planes from Top Gun and Independence Day. Then spot props and costumes from legendary movies like Terminator, Hunger Games and Austin Powers.